PH Windsolutions Inc., based in Montreal, Canada, is a supplier of production equipment for wind turbine components. Production of wind turbine blades requires the highest levels of efficiency and reliability. PH Windsolutions adheres to these exacting specifications as they are a pioneer in the design and production of automation for building wind turbine blades. 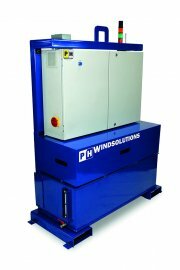 As the wind turbine industry grows, so grows the demand for production equipment from PH Windsolutions, alternatively among the transport and aircraft industries. PH Windsolutions Inc has been delivering technology to the European market since they began. In order to better serve their European customers, PH Windsolutions Inc has established an autonomous sales and service point in the Netherlands under exclusive ownership of the Canadian parent company. The majority of the resident team at this location has a background in engineering or mechatronics. The Netherlands Foreign Investment Agency (NFIA) and East Netherlands Development Agency (Oost NL) presented PH Windsolutions B.V with a number of suitable locations for their service point. Eventually, the company chose the city of Oldenzaal, due to the available knowledge and expertise in wind turbine technology in the surrounding region of Twente. Oost NL extended its support by providing information regarding the business climate, work and resident permits for expats, and introductions to relevant contacts at local vocational schools and technical universities. PH Windsolutions began with a team of 8 personnel, and expects to grow to 20 within the coming three years.